Our Founder Alan Bugg finds an unusual lump in his lower left abdomen and after many tests, and a scan, Stage 4 Non-Hodgkin’s Lymphoma is diagnosed. Alan begins treatment consisting of a proposed 6 cycles of R-CVP Chemotherapy, administered every 3 weeks if tolerated. Our Founder undergoes a further 2 cycles of R-CVP chemotherapy (making 8 in total) and gains Full Remission in April this year. Having been off work for nearly 12 months before being able to return Alan experiences financial difficulty, trouble paying the mortgage and bills, and can find very little help. Alan returns to work in September but in December the Lymphoma returns, mainly in Alan’s neck and under his armpits. They cut it out of his neck and try a different treatment regime consisting of FMD chemotherapy, 4 doses every 4 weeks if tolerated. Further financial worries arise due to a second long-term sickness off work. During the treatment period for his 2nd diagnosis our Founder decides that he wants to support others who might be experiencing the ‘ups and downs’ of living with, and fighting, cancer – the financial stress and the feeling of being alone and unable to cope. Alan realises how much of a drag cancer is, gets his partner and close friends on board and sets to work on creating a small charity called Cancer is a Drag, together with a fundraising group for Macmillan Cancer Support under the same name. His big hope is to raise enough funds to meet specific criteria set by the Charity Commission to get the charity fully registered and to be able to give much-needed financial and wellbeing support to others living with cancer. In June, our Founder gains his 2nd Full Remission from Lymphoma and we join Facebook. 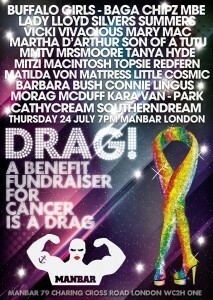 In July, Cancer is a Drag has its soft launch at London/World Pride with the Trustees, friends and supporters dressing-up in Drag as Doctors and Nurse to raise awareness and walk in the parade. Word of the charity begins to spread and friends begin to donate to our cause and fundraise on our behalf. In November, our Founder raises over £500 by growing a handle-bar moustache. In December, Alan finds another lump under his right armpit and the inevitable happens! After lots of tests early in the year our Founder finds out that as well as having a Lymphoma lump just above his left eye, it is spreading through his body. He is advised that a stem cell transplant is the only option left. It turns out that his only brother is a good match and therefore 2 x Mini BEAM chemotherapy sessions begin in June, in preparation for the Stem Cell Transplant on 23rd November. Alan cannot attend work again and realises that the charity Cancer is a Drag can really help so many if only it had the resources and support. The Drag family that exists on the London LGBT+ scene answer Alan’s plea for help and all come together to support him in his quest. Cancer is a Drag is truly born! We gain our first two Ambassadors. Big Charity Launch at Halfway II Heaven – £1,426.44 raised. Charity Spectacular at The Wayout Club – £600.37 raised (donated to Macmillan). Martha D’Arthur’s ‘Come On Down’ at Halfway II Heaven – £114 raised. and lots’ more other nights raising more money! By the end of 2013 Cancer is a Drag had donated over £600.to Macmillan’s grant-giving pot and been able to offer help to fellow sufferers including two children; little Ava who’s dream it was to visit Disneyland and meet a real princess and young Deryn, an real dude who was trapped in hospital for months undergoing treatment to save his life and wanted some new cool clothes like his mates at school. We are very proud to announce that these two beneficiaries are currently both in Full Remission and doing really well in life. In fact Ava, aged only 5, works tirelessly with her family to help other children with cancer at Ava’s Pink Quest and Deryn is currently setting up his own charity called DoEveRYthiNg Foundation. As our Founder recovers from his Stem Cell Transplant Alan and all of the Trustees give 100% of their free time to working on the charity, fundraising to support people living with cancer and getting everything in place to apply for registration with the Charity Commission. The Wayout Club 21st birthday Celebration In Remembrance of co-founder Steffan Whitfield, £607.53 – [all donated to Macmillan] ERICA & PHIL – ‘Cycle & Run’’ for Cancer is a Drag on behalf of their dear friend Stephen N H Bacon (Lady La Rue) Fundraising Campaign on indiegogo.com – £1603 raised in total. G Sundays 12th Birthday at Chicagos, Chelmsford – £203.14 – [all donated to Macmillan] Smiths Bar & Lounge – £600 raised. Halfway II Heaven’s 23rd Birthday Bash – £1000 raised in total. Charlie Rowling Cabaret at The George, Isleworth – £13 raised. 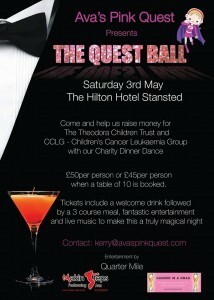 Avas Pink Quest – The Quest Ball – Cancer is a Drag support little Ava, one of our first beneficiaries, in her quest to help others by providing top class Drag entertainment at The Ball in the guise of our London Ambassador Topsie Redfern. 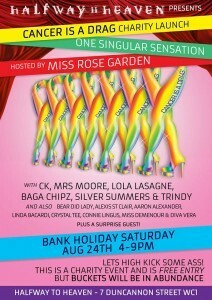 Cancer is a Drag has a Walking Group in the Pride in London Parade, under the tagline #Freedom To… Show Support in Sequins, consisting of our Trustees, Supporters & Friends, Patrons, Ambassadors, Attachés and many of London’s infamous Drag Queens. The launch of Bingay UK at Manbar with Mitzi Mackintosh.with all monies raised from the sale of Bingay tickets being donated to Cancer is a Drag. Sessions once a week 11.08 – 15.10.14 – £761 raised in total. By the end of 2014 Cancer is a Drag raised enough money in a 12 month period to meet the criteria set out by the Charity Commission to apply for full registration. We also awarded more than £2300 worth of Financial Assistance Grants (ranging from £100-£300) to individuals and their families living with cancer, give children and young adults over £300 worth of Christmas presents on cancer-related wards and respite homes in London and Cambridge and also donate just under £1500 to Macmillan Cancer Support’s grant giving pot. Our Founder celebrates his Full Remission and starts planning for a staged-return to work. 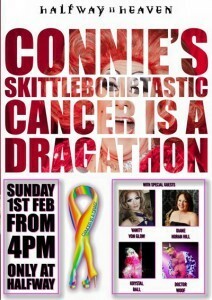 Cancer is a Drag receives notification that they are now a Fully Registered Charity with the Charity Commission – Registration Number 1160129. It is now time for us to move up a level, raise our profile, begin planning future events and campaigns, find volunteers and sponsors and realise our dream! Thank you so much Alan Bugg and your wonderful team. You made one Drag Queen Pam Olive very happy. I will use it towards my move next week. Stay up to date with what's happening, join our mailing list today and get all our news straight to your inbox!